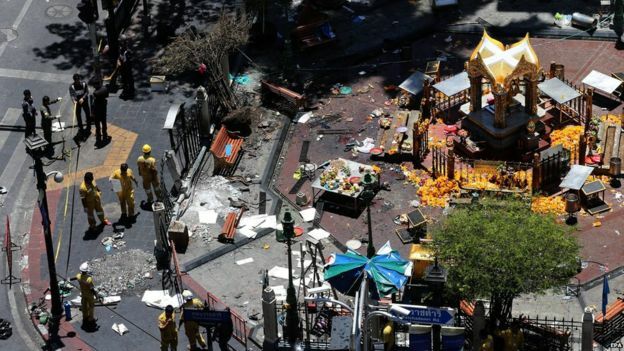 Authorities believe the bomb was targeting foreign tourists – but most of the dead and injured are Thai. The footage, from a CCTV camera, shows a man in a yellow shirt leaving a backpack in the Erawan Hindu shrine. At least 20 people died in Monday’s explosion, including nine foreigners, and more than 120 were injured. In a separate attack on Tuesday, an explosive device was thrown at a pier in Bangkok, but no-one was hurt. The spot where he was sitting is precisely where the bomb went off a few minutes later, says the BBC’s Jonathan Head in Bangkok. 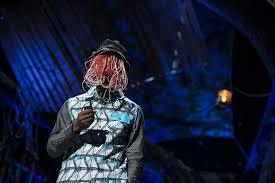 “There is a suspect… we are looking for this guy,” Prime Minister Prayuth Chan-ocha told reporters. Authorities were “quite close” to identifying the suspect, Thai government spokesman Maj Gen Weerachon Sukhontapatipak told the BBC, but other leads were also being pursued. 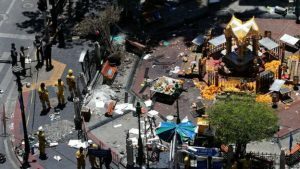 He said no motive was being ruled out, but that the bomber did not appear to be Thai and the character of the bombing was “quite different” from previous bombings by southern Thai insurgents. PM Prayuth called it the “worst ever attack” on Thailand. 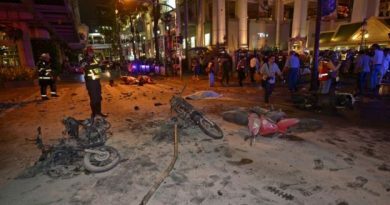 Monday’s bomb was clearly placed to cause maximum casualties, says our correspondent in Bangkok. There are suggestions this could be related to the Muslim separatist conflict in southern Thailand, but the political violence has been limited to the three southern provinces – never the capital. Others have mentioned the Muslim Uighur minority in China. They are unhappy that Thailand deported Uighur refugees back to China, where the minority complain of persecution, and might have wanted to punish the Thai state, the thinking goes. But we don’t know enough at this point to support this theory. However, international terror networks usually claim responsibility quickly after the incident, which hasn’t happened in this instance so far. One thing is clear – this is a failure of the government’s intelligence work. National police chief Somyot Poompummuang described the device as a 3kg (6.6lb) pipe bomb – an improvised device where explosive material is put in a sealed cavity to maximise the explosive impact. “The impact was so strong it sucked us forward and then pushed us back,” one witness, Leify Porter, from Australia told the BBC. She said she had seen “very graphic” scenes at the site of the explosion. It sits between a five-star hotel and a popular shopping centre on the Ratchaprasong intersection, which has been the centre of political demonstrations in recent years. Bangkok has seen a decade of sometimes violent rivalry between political factions. The military took over the country in May last year, removing an elected government following months of unrest. The capital has been relatively calm since then.